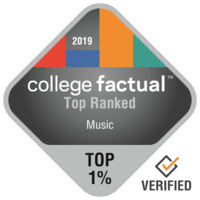 2019 Best Music Colleges in the U.S. There are approximately 16,908 people pursuing a degree in Music each year. This makes it 31st most well liked out of 384 college majors in our database. With a ranking of 95 out of a total 121 college majors for income potential, Music is not the best option when it comes to earnings. However, some schools will offer better outcomes, and some students expand their earning potential with a graduate degree. The following list ranks the best colleges and universities in the U.S. for a Music degree. Our ranking methodology takes into account factors such as education quality, average earnings of graduates, accreditation, and several other relevant factors. Searching for the very best? Consider University of Michigan - Ann Arbor in order to get an education in Music. Students from the music major at University of Michigan - Ann Arbor get 17.8% above the average graduate with the same degree. With over 20,000 undergraduates, University of Michigan - Ann Arbor is among the biggest schools in the U.S..
Boston University is a good decision for individuals interested in a Music major. Boston University offers graduate degrees in music for those interested in an advanced degree. Looking for a big school? This institution has more than 20,000 students on campus. Any student who is interested in Music needs to look into Northwestern University. In addition to its bachelor's programs, Northwestern University offers graduate degrees in Music. Northwestern University has one of the largest student bodies in Illinois. Yale University is a good decision for individuals interested in a Music major. Yale University music graduates receive 37.6% more than the typical music grad. The setting in a large urban center is great for students seeking out considerable options for social networking, excitement, and exploration. University of Illinois at Urbana - Champaign is one of the finest schools in the country for Music. Music students from University of Illinois at Urbana - Champaign receive an earnings boost of approximately 14.7% over the typical income of music majors. With more than 20,000 students, this institution is one of the biggest schools in the nation. It's hard to beat University of Southern California if you wish to study Music. In addition to its bachelor's programs, University of Southern California offers graduate degrees in Music. University of Southern California is one of the largest schools in California. The University of Texas at Austin is among your best bets if you're planning on studying Music. The University of Texas at Austin offers graduate degrees in music for those interested in an advanced degree. The University of Texas at Austin is among the largest schools in Texas. Every student who is interested in Music has to take a look at University of Miami. Grads of the music program state that they receive average early career earnings of $37,868 and mid-career earnings of $57,634. Based in Coral Gables, Florida, U Miami delivers a dependable, suburban environment for college students. The typical scholarship amount awarded to first years is $21,709 with 74.0% of first years receiving some type of scholarship. Considering the fact that 7.0% of college grads have defaulted, U Miami's default rate of 2.3% is really good. Go on a virtual tour for more information on U Miami. Rutgers University - New Brunswick is among your best bets if you want to study Music. Grads of the music program state that they receive average early career wages of $41,439 and mid-career wages of $71,386. The setting in a big city is tremendous for scholars trying to find adequate chances for social networking, experience, and life. Any student pursuing a degree in Music needs to look into University of Maryland - College Park. University of Maryland - College Park offers graduate degrees in music for those interested in an advanced degree. Positioned in College Park, Maryland, UMCP offers a dependable, suburban environment for young people.